Cool painting ideas can be found almost anywhere. But, have you ever noticed that it's easier to get excited about a landscape idea when the scenery is different than back home? I love to travel. And I love taking pictures of everything that's different from what I’m used to seeing. However, the continual challenge when you get home is finding the cool painting ideas in the pictures you shot. As I've mentioned in color painting tips in the past, it often helps to create the best, most interesting subject by moving in closer to it. 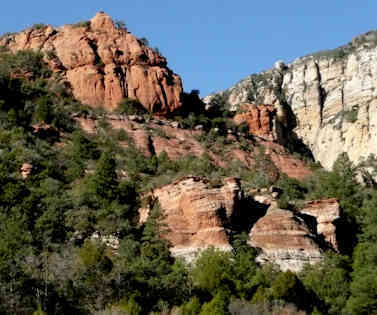 For example, below is one of the photographs from Sedona, Arizona I've been showing you the last couple weeks. Beautifully weathered and eroded red sandstone huddled next to towering cliffs. If you've been following my landscape painting tips the last few weeks, you would at least consider creating a more intimate view of this red sandstone behemoth. By coming closer, you can focus on the summit which is where the cool painting idea lies. And that allows you to eliminate most of the trees. Only trees doing something interesting, like cartwheels or back flips, can stay. The rest should be sent home. Another composition technique is to make use of diagonals. If there aren't any, create them. Luckily, this scene has two strong diagonals. One in the red rocks, and another in the lighter cliffs behind them. The next challenge in painting this scene is making these rocks feel like rocks. Now, I have to be honest here. My first attempt at painting these rocks did not go well. When that happens, wipe off the paint and start again. If something really is a cool art painting idea, then its worth doing right. Better to erase or wipe off your paint than to try to cover up your mistakes with even more paint. So, out came my old 2 inch house painting brush and the rocks I'd just painted slid off into the waste can. After a bit more struggle I realized I was trying to be too literal in depicting rock. The secret came down to simple color values. 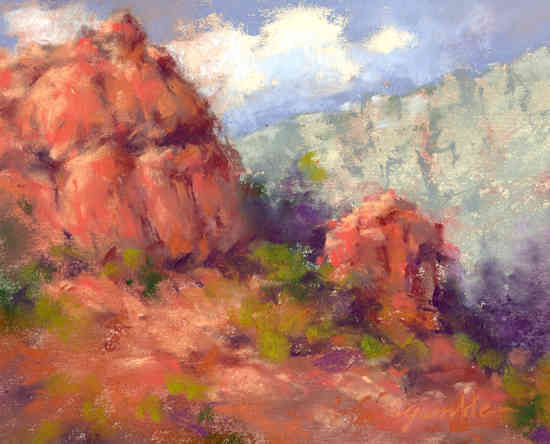 When I loosened up and allowed my strokes of pastel to show with minimal blending, that's when the rocks became rocks. And whether you paint with pastels, oils or acrylics, that landscape painting tip applies just as much to you. 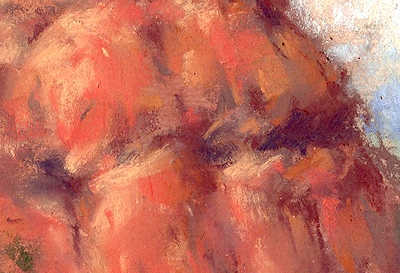 Letting the different color values and strokes of paint show approximates the uneven surface of actual rocks. And close up, the strokes add a nice, almost abstract quality to the painting. They help make this a cool painting idea. P.S. There is much more I could explain about the why's of this painting. …a free 30-minute "Free The Artist Inside You" coaching session with me. ● We’ll work together to create a crystal-clear vision of the artist you can become. ● You’ll uncover the hidden challenges that may be stopping you from becoming that artist. 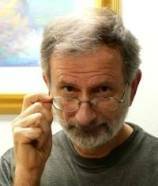 ● And you’ll leave the session renewed, energized and inspired by the next step you can take to finally unleash the creativity you know you have. Just click here to schedule your 30-minute "Free The Artist Inside You" coaching session during one of the time slots I have available. 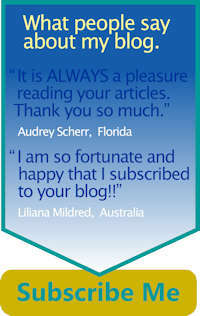 I look forward to talking with you and helping you become the artist you are capable of being.